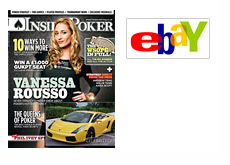 Team Pokerstars Pro Vanessa Rousso's 2007 Lamborghini Gallardo is currently listed for sale on Ebay through Celebrity Cars Las Vegas. Rousso purchased the Lamborghini back in 2009. "Not long ago Vanessa decided to get herself a "small gift" for some of the poker winnings. A yellow Lamborghini Gallardo (costs $180,000-$210,000 in USA) as in the picture on the right side is what she bought. Even though this model is the most produced car by Lamborghini, there are only 5000 of its kind in the world. This car (Apart from the big engine) comes with a computer, IPod connections, USB connections, heated mirrors, and hand knitted seats, just to mention few of the things this luxury sports car has." The car is yellow with black interior and currently has just 12,875 miles on it. Vanessa Rousso currently has $2,639,991 in total lifetime tournament cashes, which puts her in fifth place on the women's all-time money list. Rousso's largest career cash came in the EPT Grand Final High Roller event in 2009, which she ended up taking down for just under $750k USD.